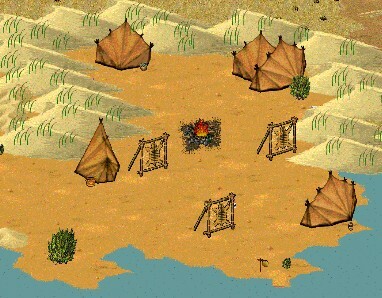 Description: Akordo Sabla is located in the Dunes. The inhabitants are quite relaxed and enjoy their life close to the sea. Their creativity results in the fabrication of richly carved, but still very useful shields. Every shield is a handmade unique and so it may take some time until the next shields are being sold. Description of the way: The way to Akordo is quite dangerous. It leads to Akvumi and through the tunnel into the Gloomy Woods. From there you have to go 1W and all the way south. If you see a tower at the sea, go 1E again to enter the main town. This page was last modified on 12 October 2007, at 19:00.